We all have that one piece of furniture that needs a little face lift or make over. It can be an old table,chair or even a dresser that needs a little love. Many times figuring out what exactly to do with it can be tough. However, there are many ways to make an old dated look new again with a few fun ideas that are easy to do and inexpensive. 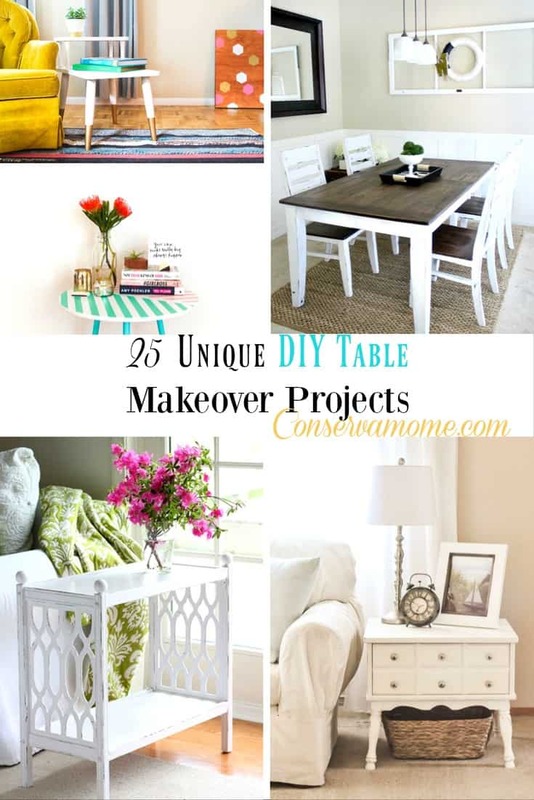 Check out this fun round up of 25 Unique DIY Table Makeover Projects that will help you turn any dated piece into a fun furniture set that goes with your home. Don’t have any tables to fix up? Head to your nearest goodwill or yard sale and grab an inexpensive piece that you can turn into something that you grabbed from a Pottery Barn catalog. There are so many good ideas for makeovers here. I have a table that needs a makeover. Omgosh I love so many of these!! What a great way to change up the decor!! I love the mosaic idea!! Ooooh I love these ideas! I wish I had the time to try some of them. Maybe one day. Omg the sea glass one!!! These all are awesome though. I love DIY projects! I have a few I’m still trying to finish, but these look great! I especially love the distressed wood side table.